Introducing the many-legged Topsham tree. Paula has a weekly challenge where she invites us to post an image on a different them each week and I’m joining in for the first time. I’ve been lurking for a few weeks but this time I couldn’t resist as I love street art. This is a bit different, subtle instead of bold, it’s subdued colours portray a time when Topsham was a busy fishing port. Paula can be found here if you’d like to join in. Today I took the dogs for a favourite walk at Topsham, one of those places I never tire of, if you keep your eyes open there’s always something to see. We started off by checking Vigilant’s progress, you may remember her?It’s a slow and expensive process but she’s looking healthier. We headed off down the Strand, a pretty street with the river to the right and houses of all shapes and sizes, some with a Dutch influence, to the left. Some have gardens across the road that lead to the river, I love having a sneaky peep. They can even grow Housetrees here! where Daisy just couldn’t resist the mud. where the Goat Walk begins. There are benches all the way along, but the sun was hiding under the clouds so we didn’t linger today, except to listen to a young boy telling his little sister about the solar system and illustrating it in the sand. I think that in days gone by there must have been a big estate behind the wall, with this gate to the path so that they could go goat strolling. There are several big, old houses across the fields. We turn left and the end and leave the river behind for a few minutes. Wildlife only on the left, but here’s the view. Not too bad is it? If you have sharp eyes, you can see the train. If you’re ever down this way, check the tide is low and catch the train from Exeter to Exmouth, even Michael Portillo featured it recently on his Great Railway Journeys. This is the point where the river Clyst flows into the Exe. Exmouth is on the horizon. I went back to the main path and headed for the bird hide, as usual I forgot to bring binoculars, but a kind RSPB volunteer let me use his to see some Snipe out on the mud. No photos, I only had my phone, but I doubt that my camera would have helped at this distance. They are there though I promise, and the chanting was wonderful. I’ll leave you with this last view, and walk up Bowling Green road to complete my circular walk by the railway bridge where I left my car. I’m sharing with Jo, she’s probably feeling the chill this week! 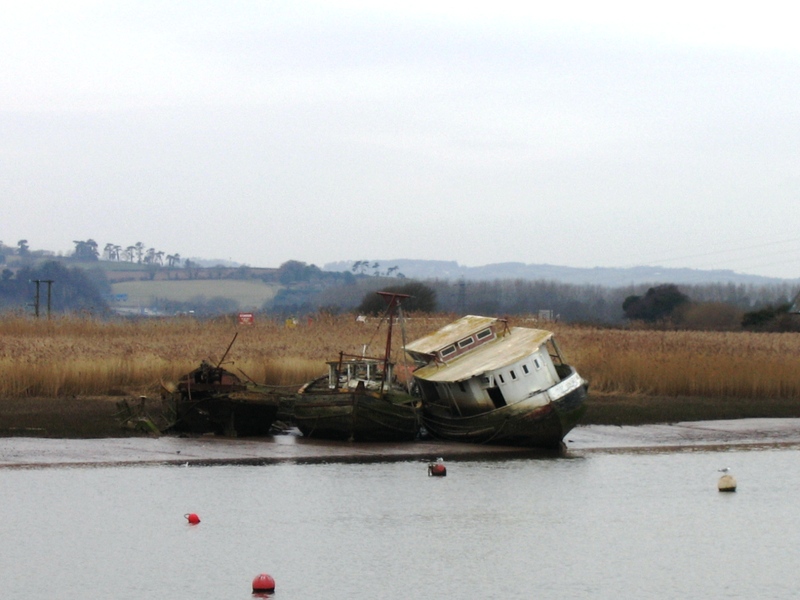 For many years now this boat has been abandoned in the river Exe opposite Topsham quay. When the tide is low, you can see how much mud it’s trapped in. I’ve been watching it decay, and I’m sure I’m one of many, many others doing the same. It’s acquired an almost iconic status, the view just wouldn’t be the same without it. One day it will no longer be there, the forces of nature will have totally reclaimed it to the earth. This post is for the Weekly Photo Challenge, Forces of nature. ‘ For this week’s photo challenge, show us abandoned. You can go literal, as I have, and share a photo of ruins, a desolate place, or your idea of a wasteland. Or you can interpret it in other ways, from images of overlooked things to forgotten people. I’ve decided to show you two boats, both abandoned locally. The first is on the Exeter canal, I took the photo about two years ago but I think it’s still there. 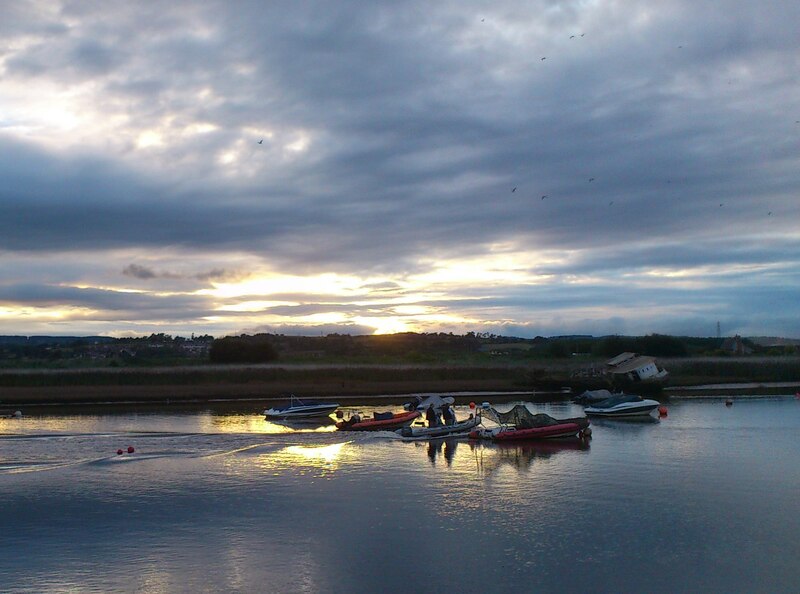 This one was taken years ago from Topsham Quay looking west. This old beauty is just part of Topsham now and is much photographed. 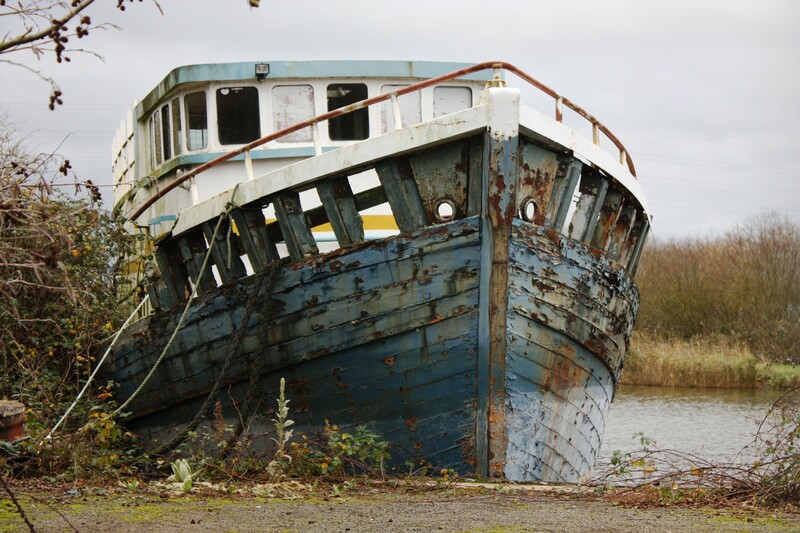 What is it about a decaying boat that appeals? If it was removed now the view wouldn’t be the same at all. Just to show it’s still there, I took this one more recently. The boat is on the far right. I read about construction of a connecting section of the Exe trail some time ago and when I learnt that it had opened recently, I dragged the family out at Christmas to check it out. The trail covers about twenty six miles from Dawlish on the west of the Exe to Exmouth on the east and is part of National Cycle Route 2. Way back when I’ve cycled the west side, but now walking, camera in hand, on the east side is more my thing. I’ve shown you many photos of Topsham before and the new link begins at Bowling Green Marsh, from there it crosses the River Clyst via a new 120 metre bridge, which was floated down the Exe on barges. The bridge goes across the RSPB Goosemoor Nature Reserve, providing stunning views of the area that have never before been accessible. The photos above are all on the original partof the walk. Over time the bridge and boardwalk will blend in. To be honest I’m disappointed that the sides are quite so high and there are just peepholes to look through, but of course the wildlife has to be protected. It was a freezing cold day at the end of December but I’ll start at the bridge next time and head further east. It’s definitely a wonderful cycle route! Just a little selection from a walk on Thursday evening, mobile in hand.